“In meditation we are growing to what Thomas a Kempis calls ‘a familiar friendship with Jesus.’ We are sinking down into the light and life of Christ and becoming comfortable in that posture. The perpetual presence of the Lord…moves from a theological dogma to a radiant reality. ‘He walks with me and he talks with me’ ceases to be pious jargon and instead becomes a straightforward description of daily life” (19). “What happens in meditation is that we create the emotional and spiritual space which allows Christ to construct an inner sanctuary in the heart” (20). It was this latter description that guided me when I thought of meditative exercises for my children. Elsewhere, Foster defines Christian meditation as “the ability to hear God’s voice and obey His word” (17), but I thought that definitively “hearing God’s voice” might be a tall order for a nine- and ten-year old. Instead, I loosely defined meditation to them as thinking deeply, and Christian mediation as thinking deeply and reflecting on God. I then introduced meditative exercises to them with the goal of creating that emotional and spiritual space where Christ could enter. To meditate on Scripture, I taught the kids lectio divina, which sounds fancy, but really is just a practice of reading a short Scripture several times and reflecting and praying over it. I started with Psalm 23, since that was the first passage I had heard used with lectio divina. I invited the kids to get comfortable and close their eyes, and then I read the Psalm slowly through, asking them to imagine every detail, to really try to put themselves in the scene. I invited them to walk through the green pastures, to sit by the still waters. This first time, we talked about each step in between readings, and they eagerly told me of all they imagined. Then, I read the passage a second time and asked them to pay attention to what jumped out at them. I encouraged them to focus on that one part and reflect on what that means for them. What jumped out to Anna was, “he makes me lie down in green pastures.” It was the “make” part that spoke to her. As she put it, “The shepherd had to MAKE the sheep do a good thing, because the shepherd knew what was good for the sheep. And there are things in my life that are good [here she named a few] but that I don’t want to do. And probably, God put those things in my life because He knew they were good for me.” What stood out to Luke was walking “through the valley of the shadow of death” and the fact that God was with the psalmist in those times and would so be with us. Lastly, I read the scripture a third time and asked them to pray over what had stood out to them, or to “give their thoughts back to God,” as I described it. Anna prayed that God would give her the strength to do the good things, trusting they were good for her, and Luke thanked God for His protection. It was a simple enough exercise, and required no preparation other than picking out a Bible passage, but it yielded some good reflection and discussion. Throughout the month, I used other passages, such as Psalm 19, the story of the widow’s mite (which was the kids’ Sunday school lesson that week), and the story of the Good Samaritan. I focused on the Good Samaritan because I had gained an awareness that week that the kids were failing to understand that whole “Love your neighbor as yourself” concept in some key ways. Thus, I chose that passage at that week’s lectio divina reading, and later that day, I had the kids color a sheet about the verse. As the adult coloring craze attests, coloring can be a meditative, mindful exercise, so I hoped to link those benefits with this particular scripture. The kids enjoyed the exercise surprisingly well and really focused on their coloring projects. So that was a fun, meditative way to focus on scripture, as well. If you would like a simple guide to practicing lectio divina with kids, I made one that you can download HERE. Foster also suggests meditating on God through nature. In my own experience, meditating on nature always naturally leads me to awe and worship, and I have been trying for years to instill that thought path in my children. It’s almost become a joke how many times I force them to stop reading in the car and look out the window and something pretty, and then—because I have a didactic, instructive tendency—to rhapsodize on what a wonderful Creator would make such a beautiful thing. Another practice I’ve tried to instill in them is the practice of nature journaling. I love this concept in theory, but I’m not personally an artist and gain no great pleasure from drawing, and perhaps that’s why I’ve had trouble being consistent with this discipline. Regardless, the kids had nature journals all five years of homeschooling, and they aren’t even a quarter full. Meditation gave me the inspiration, however, to renew my focus on nature journaling with them. We journaled regularly throughout the month, and I tried to preface each session with a challenge to meditate on what they were seeing, and to let nature’s beauty and intricacy point them back to God. “So give your attention to the created order. Look at the trees, really look at them. Take a flower and allow its beauty and symmetry to sink deep into your mind and heart. Listen to the birds—they are the messengers of God. Watch the little creatures that creep upon the earth. These are humble acts, to be sure, but sometimes God reaches us profoundly in these simple ways if we will quiet ourselves to listen” (31). 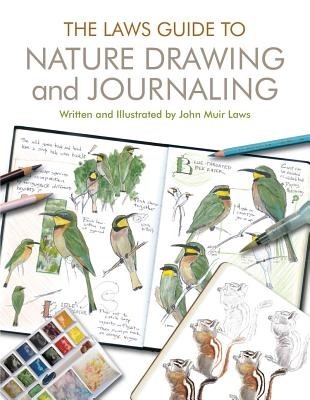 In focusing on nature journaling, one resource was invaluable to me, and I would recommend it to any person in any situation: Laws’ Guide to Nature Journaling and Drawing. It was this book that finally got me to pick up a journal and pencil, and to participate myself in what I had just been having the kids do. This book is beautiful, philosophical, instructive; I really cannot say enough good things about it. 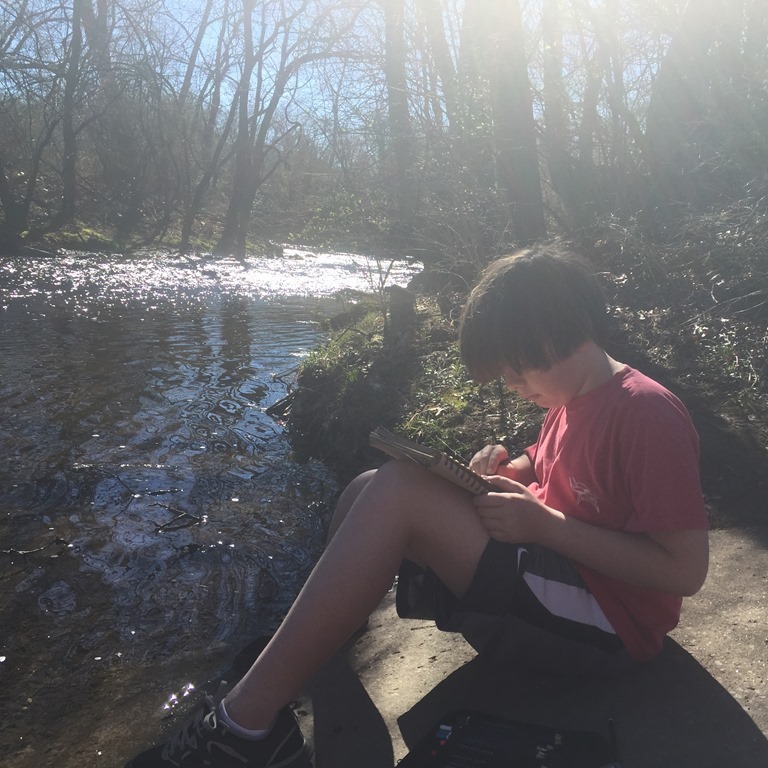 Because of its depth, I think I get way more out of it than the children, but it is also excellent at breaking down the process of nature journaling into simple pieces, which I use as individual lessons for the kids. Plus, the sample journal pages throughout are beautiful and inspiring. I also enrolled the kids in a nature journaling program at our local state park, which they were happy to attend with friends. 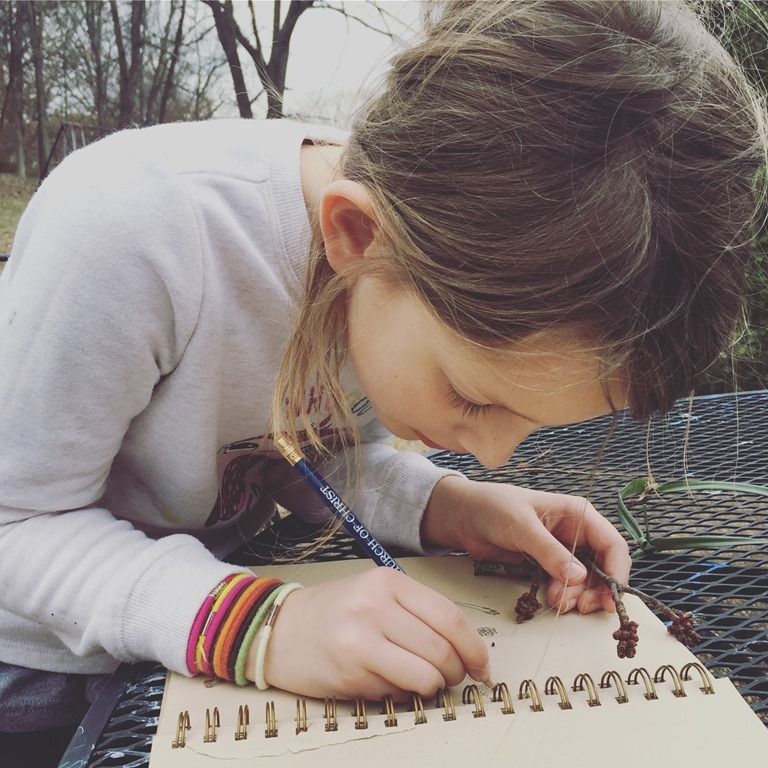 All in all, nature journaling was one of the primary ways we focused on meditation this month, and I think we all benefited greatly from it. I can’t emphasize enough what an improvement these descriptions are over the ones in past years! I very much enjoyed our month of meditation and probably got more out of it than the kids did, just because I already enjoyed the practice so much. However, I think we were able to find some simple practices that were beneficial for the children: Lectio divina, Scripture coloring, and nature journaling all drew our minds closer to God, and meditating on the people God has given us also made us more grateful for His blessings. And now, since Lent starts on March 1, we turn our minds to fasting! This blog post is part of a series called, A Year of Spiritual Disciplines, in which I blog about my attempts to introduce my children to a different spiritual discipline each month of 2017. My purpose in sharing this journey is to share ideas and resources with other Christian parents who seek to disciple their children.